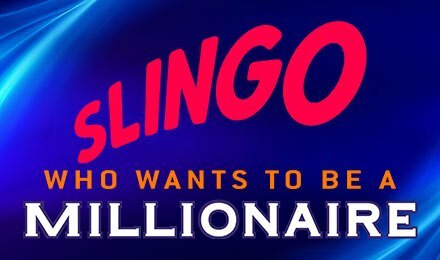 Slingo Who Wants to be a Millionaire is a game that combines Slingo, instant win and one of the world’s most popular classic TV shows into one blockbuster of a game. This game incorporates many of the original TV show’s elements as symbols in the game. It even has the show’s soundtrack! This game has an RTP of 95.9%, much higher than the average Slingo games, and gives you some really solid cash prizes. And, as the name suggests, this game has a jackpot prize of £1 million – in real money! This game is available on the Slingo website and you can use your Slingo login to access it. Or, you can play the game on one of the many casino sites that hosts it. The game has the typical Slingo 5x5 number grid which is on top of the slot reel. On one side is the Pay Table, which consists of symbols representing the TV show. The object of the game is to match the numbers one the reels to those on the grid and cross them off until you win a Slingo. A Slingo is achieved when you complete an entire horizontal, vertical or diagonal set of numbers. You get 9 spins to win the game. If you have run out of spins, you can buy an unlimited number to continue the game. However, the price of the spins increases with each unsuccessful spin. First set your wager for the game. You are given 6 different betting options to choose from. They range from £1 to £5 and the biggest wager is for £10. To get pay outs, you need to complete the Who Wants to be a Millionaire symbol collection. The game grid is surrounded by fields that have question marks on them. Every time you win a Slingo, the symbol linked to the line you won will show a randomly selected game symbol. To complete those collections, you need to win as many Slingos as possible in the game. The maximum bet will give you a Full House prize of £100,000! If you are looking to win that mega-Jackpot of £1 million, then you need to get a Full House in 7 spins or less. This game has a large number of special symbols, taken both from classic Slingo as well as from the iconic TV show. The Joker:This wild appears on the reel after a spin and it allows you to mark off any number in that column of the grid. The Free Spins:During gameplay, you can get lucky and win a free spin, which will be used after you have finished all 9 spins you started with. TV Show Symbols:The fields around the grid contain symbols taken directly from this TV show. They include the Phone a Friend, the 50:50, Hot Seat, etc. While Slingo WWTBAM does have bonuses like Jokers and Free Spins (as described above), there is no special bonus round. However, the symbols in the fields around the grid have special functions. As you win Slingos, the symbols in the fields appear. You need to complete collections to win a pay out in the game.